Play Blood Suckers Slots | Get a £500 Welcome Package! Head to Transylvania where the vampires roam to play Blood Suckers Slots! Win 100 times your stake plus FREE Spins with the Vampire Bride! 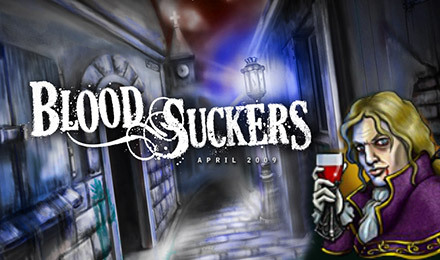 Blood Suckers Slots is a chilling vampire themed online slot game from Net Entertainment. The graphics and sound are super scary and will make your spine tingle with fright! Spin to WIN this terrifying 25 payline slot game today! The Vampire Bride is the Scatter symbol and can pay you up to 100 times your wager plus grant you Free Spins with tripled payouts! The bloody Stake and Hammer is the Bonus symbol and can activate the Bonus game for frighteningly huge wins! The Wild symbol is represented by the vampire biting the woman’s neck and can help you win by replacing other symbols on a payline!